Type and Characteristics - Patrol vessel cutter, Thetis-class WPC-102, built by Lake Union Dry Dock & Machine Works, Seattle, Washington, launched 16 June 1934, & commissioned on 20 September 1934. Displacement 337 tons (1933) 350 tons (1945) full load; Length: 165&apos;, Beam: 25&apos; 3", Draft: 7&apos; 8" (1933); 10&apos; (1945); Machinery: 2 x Winton Model 158 6-cylinder diesels; 1,340 bhp; Propellers: twin, 3-bladed; Performance: Maximum speed: 16.0 knots, Maximum sustained: 14.0 knots for 1,750 statute miles, Cruising: 11.0 knots for 3,000 statute miles, Economic: 6.0 knots for 6,417 statute miles; Complement: 5 officers, 39 men (1933) 7 officers, 68 men (1945); Armament: 1933: 1 x 3"/23; 1 x 1-pounders; 1941: 1 x 3"/23; 1 x Y-gun; 2 x depth charge tracks; 1945: 2 x 3"/50 (single-mounts); 2 x 20mm/80 (single mounts); 2 x depth charge tracks; 2 x Y-guns; 2 x Mousetraps. Electronics: 1933: none 1945: Radar: SF; Sonar: QCO. Cost: $258,000. Log Period and Areas of Service - 1934-47, based in Seattle with the Navy's Western Sea Frontier, with annual trips to the Bering Sea. 20 September 1934 – Commissioned and assigned to Seattle, Washington. She conducted search and rescue and law enforcement patrols as well as participating in annual Bering Sea patrols. September 1942 – Her armament was increased at the same yard that constructed her. She was then assigned to duty with the Navy's Western Sea Frontier and continued to be based out of Seattle. She conducted war patrols and escorted merchant vessels throughout the war. 1945 – She underwent additional changes to her construction and armament. 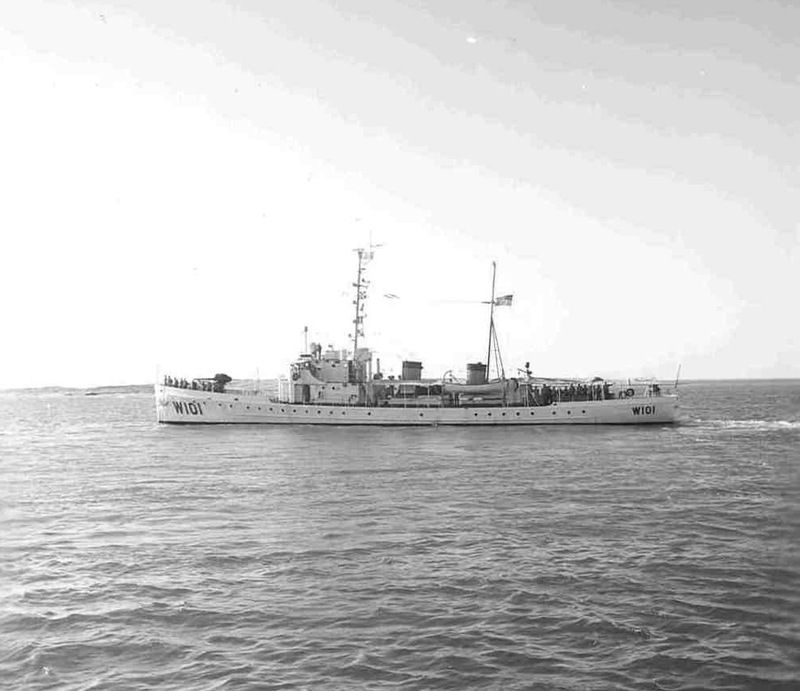 1 August 1950 – She was decommissioned and placed in storage at the Coast Guard Moorings in Kennydale, Washington. Fate – Decommissioned 1 August 1950, sold to Birchfield Boiler, Inc., of Tacoma, Washington on 7 December 1954 for $7,156.00.